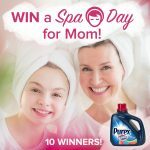 PUREX Promotion – WIN a Spa Day for Mom! Ten grand prize winners will receive a $100 Spa Envy Gift Card and a year’s supply of Purex Plus Clorox 2 Detergent. I could definitely like to win any one of these. A day at the spa would great. The most interesting for me is the gasoline. I am disabled so I could use any one of these. My daughter is the only child I have living with me but she is 40y/o. I have used the purex brand of soap & find it to be very good. With raising 4 boys (and their many friends!) who couldn’t use more great laundry soap!! As a daily mail carrier, I would LOVE a spa day!! Thank you for all you do! Good luck Brittney. A day at the SPA would be nice after all the work you do raising the little ones.